“I learned that hot spots aren’t hot every day, even at the right time of the year.” I wrote that about visits to Dauphin Island, Alabama, and High Island, Texas, during my big 2012 Texas trip. It sounds like I learned a valuable lesson, right? Wrong. I left for Minnesota in late October already counting my life Northern Goshawk that I would see at Duluth’s Hawk Ridge. How could I miss? 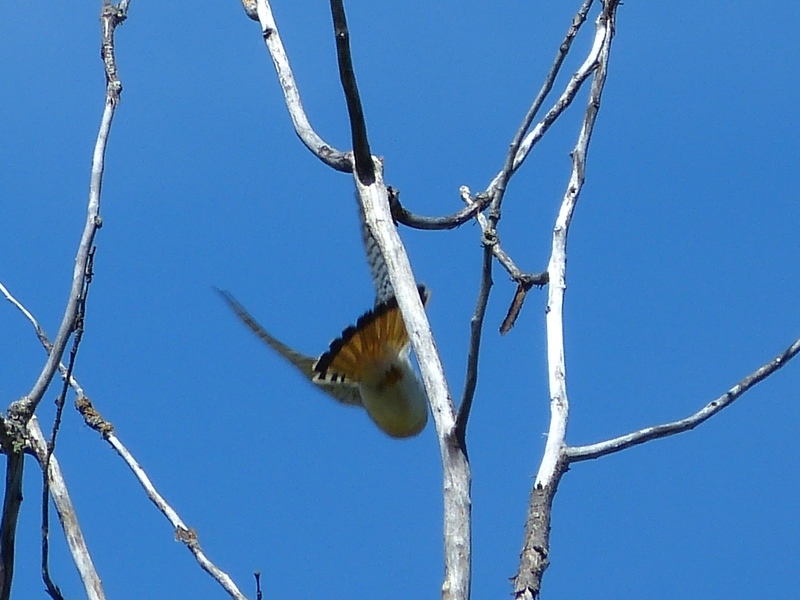 “They fly right over your head” folks said when describing the wondrous spectacle of hawk migration in Duluth. Well, I did miss the bird. But, fortunately, I also had other goals for the trip. 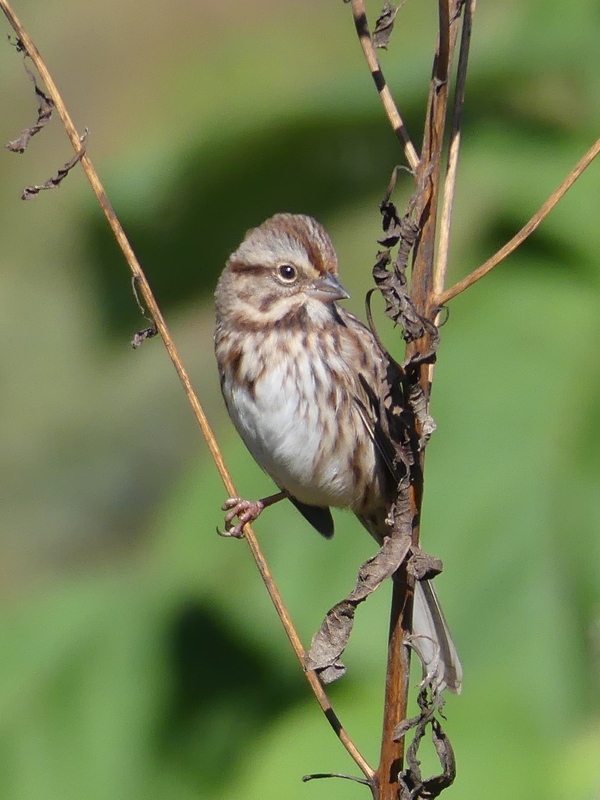 I saw this pretty little Song Sparrow before I was out of North Carolina. 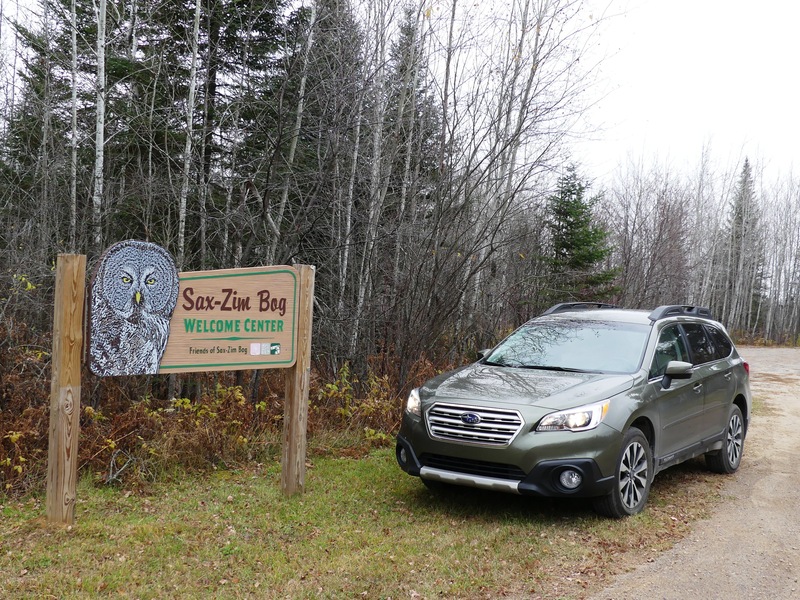 Ever since I bought my new wilderness green Subaru Outback two years ago, I have been dreaming of birding road trips. Until this fall, my longest trips had been to Florida, but now I had an opportunity to test drive a more adventurous trip. 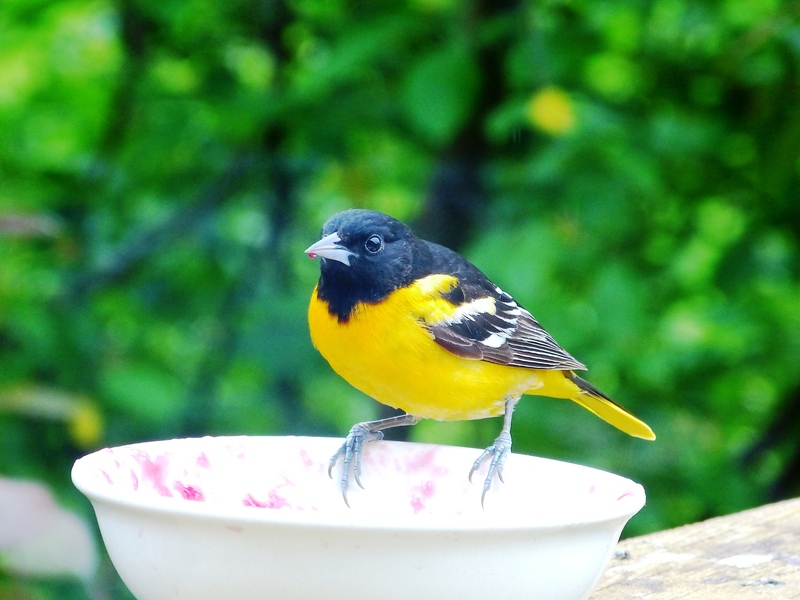 I would also have a chance to indulge my growing obsession with state birding. I have had an interest in seeing the number of states on my birding lists grow for a long time, but the new eBird personal profile pages with maps fueled a need to fill in the blank states. If I took the western route north and a more eastern route home, I could add five new states. My first new state was Missouri. I spent the night just the other side of St. Louis and checked the BirdsEye app on my phone. Cuivre River State Park was just half an hour away and many birds had been reported there. Perfect! I drove to the park on the morning of Wednesday, October 26. I quickly discovered that the park is huge (6,300 acres) and I didn’t have a clue about where to find the best birding spots. I did not find many birds that morning, but I enjoyed driving around the park and walking a couple of short trails. Note for my next trip: you can’t do too much research about birding locations. The next state was Iowa, where I met Tom Dunkerton, an excellent photographer and naturalist who I met in Florida a few years ago. Due to schedule constraints, we expected to have only one morning together, but Tom surprised me by calling Wednesday afternoon and saying that if I could get to Neal Smith NWR before dark, he would show me around. That was incentive enough to drive there from Missouri without dawdling along the way with unnecessary stops. We had about 45 minutes to drive around the immense NWR before dark, a place I will be sure to spend time on my next trip. 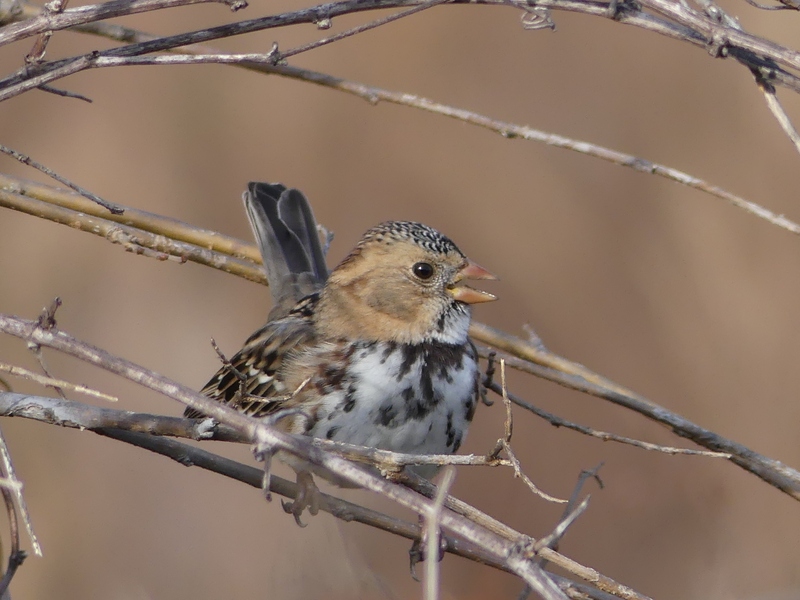 A young Harris’s Sparrow sings in Jester Park. Tom picked me up on Thursday morning and we headed to one of his favorite sparrow spots – Jester Park. 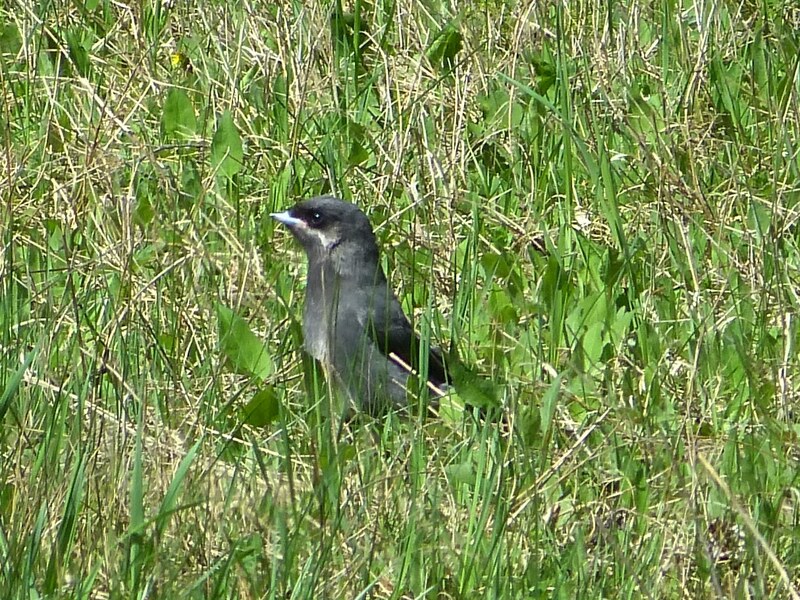 We saw several species, all up close, feeding on grass and weed seeds. I could have stood there all day soaking in the beauty of these birds. 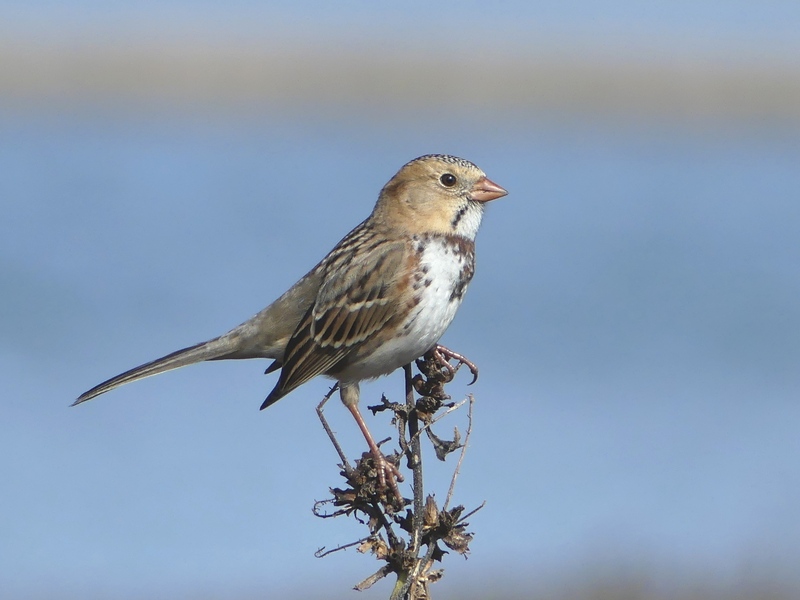 Tom captured the magic of the morning with this video of a young Harris’s Sparrow singing. 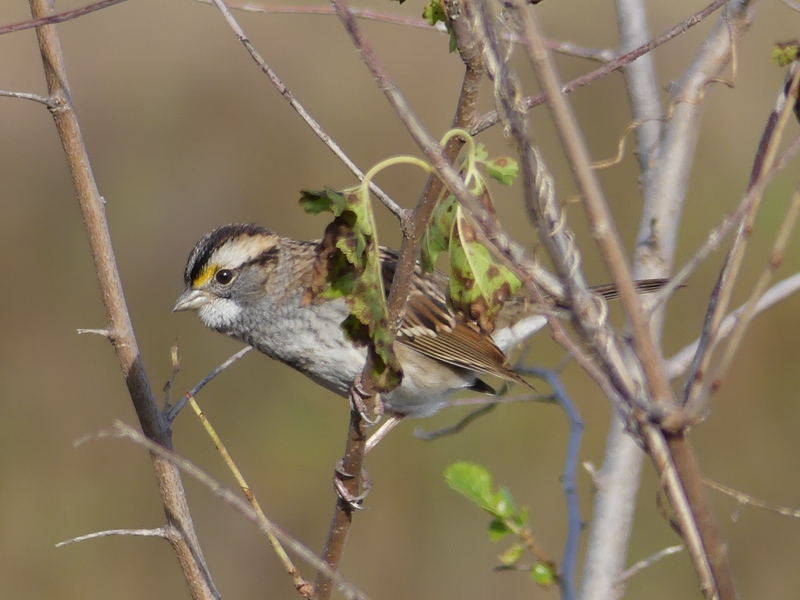 The best surprise of the trip was that LeConte’s Sparrows were still in the area. I had assumed that they would all be south by then, but a few lingering birds were still around, so we left Jester Park to look for LeConte’s Sparrows. I was thrilled to get wonderful close looks and even a few photographs. I wish that morning could have lasted for days, but Tom had to get to work and I needed to drive to Minnesota. 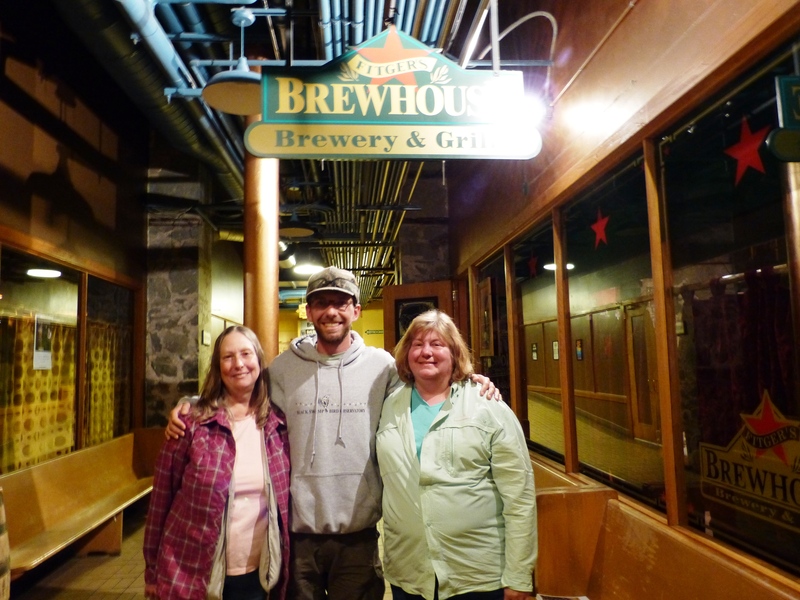 It was great to see Diane, one of my favorite birding buddies, and we enjoyed the chance to catch up during our drive to Duluth the next morning. On Friday afternoon, we met Angie and the three of us went to Hawk Ridge, location of one of the best-known hawk watches in the country. I was shocked to discover that they had seen very few raptors that morning. The weather was awful so the prospects for the afternoon were no better. The hawk counters advised us to come back in the morning at 7:45 AM. Sax Zim Bog was less than an hour away, so we headed that way and spent the afternoon enjoying the simple pleasures of the bog. Our favorite sight was a large field with a carcass that had attracted four Bald Eagles, three magpies, crows, and ravens. My car at the Sax-Zim Bog Welcome Center. The following morning we returned to Hawk Ridge. I patiently watched the Goshawkless skies for over four hours before giving up. The few raptors that had come by were too distant to see well, so I didn’t feel like we’d be giving up much if we left. 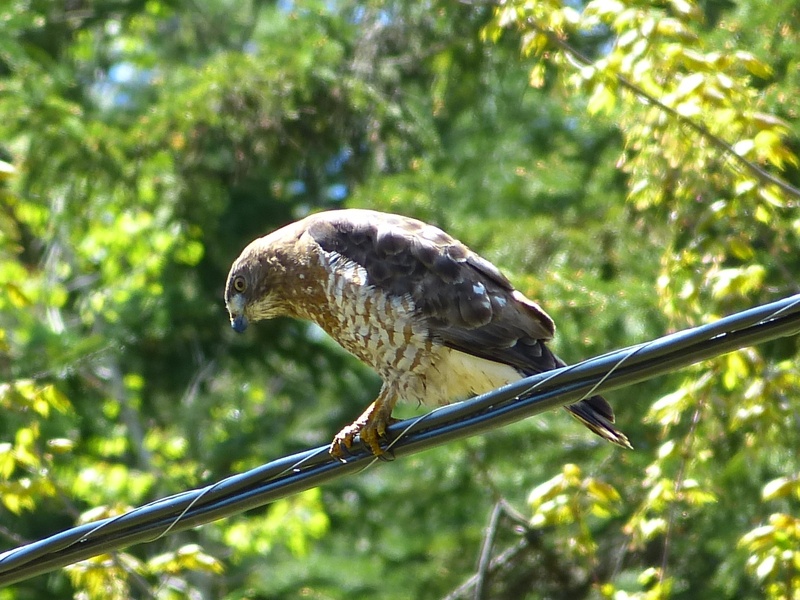 If I was going to see a Goshawk, I wanted to see it well. They did have one juvenile Goshawk after we left, but I did not regret the lovely afternoon drive along the Lake Superior shoreline enjoying a gorgeous fall day with friends. 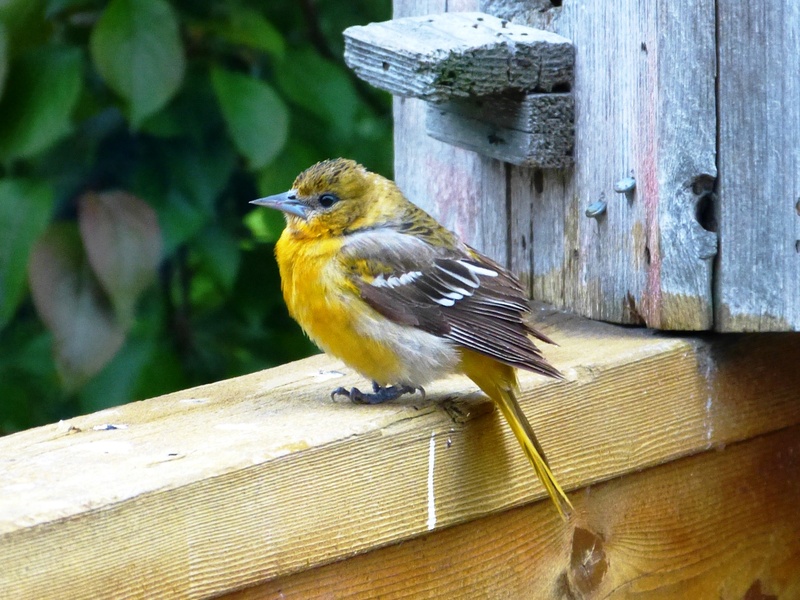 By this time, I had reconciled myself to missing the target bird of the trip, so when Angie told Diane and me that Sparky Stensaas, executive director of Friends of Sax-Zim Bog, was leading a field trip at the bog on Sunday, we immediately decided that we wanted to go. I was surprised to see about 25 birders show up the next morning. It would have been worth it just to hear Sparky’s commentary on the bog and its birds. We learned about Rough-legged Hawks. The have tiny beaks because they eat small prey, mostly voles. And, it’s suspected that they can see concentrations of vole urine. Amazing! And, we had great views of a Rough-legged Hawk hunting in the bog. 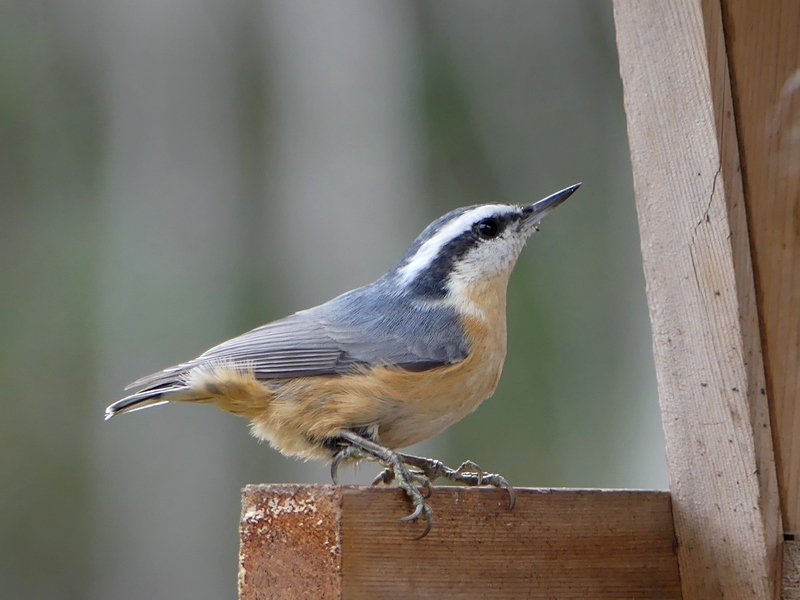 Red-breasted Nuthatches enjoy the feeders at the Sax-Zim Bog Welcome Center. 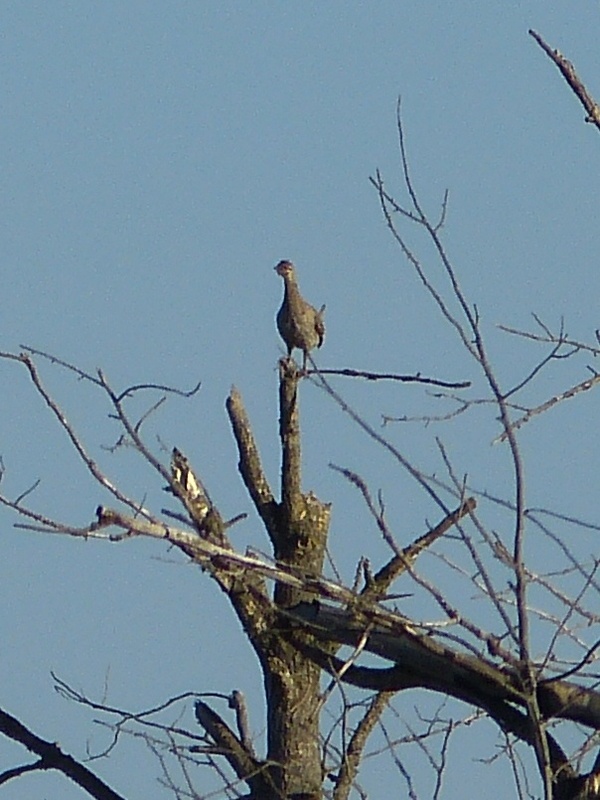 We also saw two Ruffed Grouse during Sparky’s trip, but I was unable to get a photo. Sparky gave us directions for a route back to the highway with good chances for more grouse. We saw one right away, but a passing truck flushed it into the woods. And, then we saw another. This was the most cooperative grouse ever, allowing us long indulgent looks and many photographs. The bird did look at us with a wary eye, but then went back to feeding on the side of the road, and finally walked into the woods. It was, as Diane called it, a sacred moment, and one we will always cherish. A Ruffed Grouse in the Bog. Diane and I drove back to her house near Minneapolis that afternoon and I left for the long, slow drive home the next morning, on Halloween day. The first stop on my way south was in Illinois, to stay the night and visit with my friend David’s mother, Darlene. We discovered that Rock Cut State Park was just a couple of miles from her house, so I invited Darlene to go to the park with me on Tuesday morning. We didn’t see many birds, but did find quite a few butterflies and enjoyed our walk on a gorgeous fall morning. Our walk was longer than planned because I took the wrong trail. We were lost, but we ran into a man walking his dog who gave us directions. We walked a while longer, following his directions, and suddenly the man and dog were walking towards us. He had come back to check on us and walked the rest of the trail with us. He waited with us when we stopped to catch our breath and helped Darlene over a rough spot in the trail. After this heart-warming start to the day, I drove almost to Indianapolis. On Wednesday, I continued the pattern that was developing for travel days – visit a park in the morning and drive in the afternoon. This time is was Indianapolis’ Eagle Creek Park, one of the largest city parks in the nation with 1,400 acres of water and 3,900 acres of forest. On Thursday morning, I visited the last park of the trip, Hisle Farm Park, near Lexington, Kentucky. I picked it because it looked like it wouldn’t be far out of my way, not because I expected much. No one else was there when I arrived and I didn’t see or hear any birds. I got out of my car anyway and soon heard meadowlarks singing. I walked in their direction and soon heard more birds. I walked about two miles through fields and along the wooded edges. Song Sparrows were everywhere, Robins and Cedar Waxwings covered the treetops. 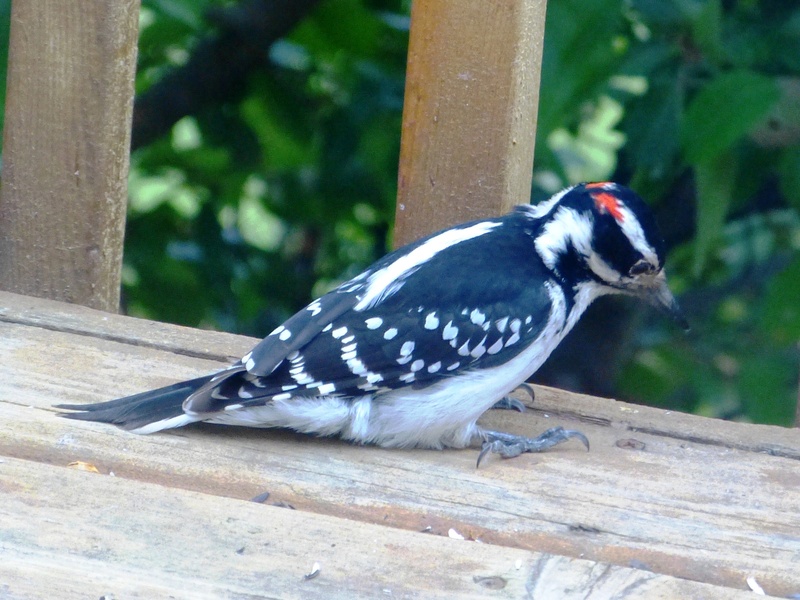 In one little spot in the sun, I watched Song, White-throated, and White-crowned Sparrows, Titmice, Chickadees, Goldfinches, a Golden-crowned Kinglet, and other birds all feeding on the ground and in the low berry-covered shrubs. The temperature was just right; there was the slightest breeze. It was a perfect end to the birding for my trip. 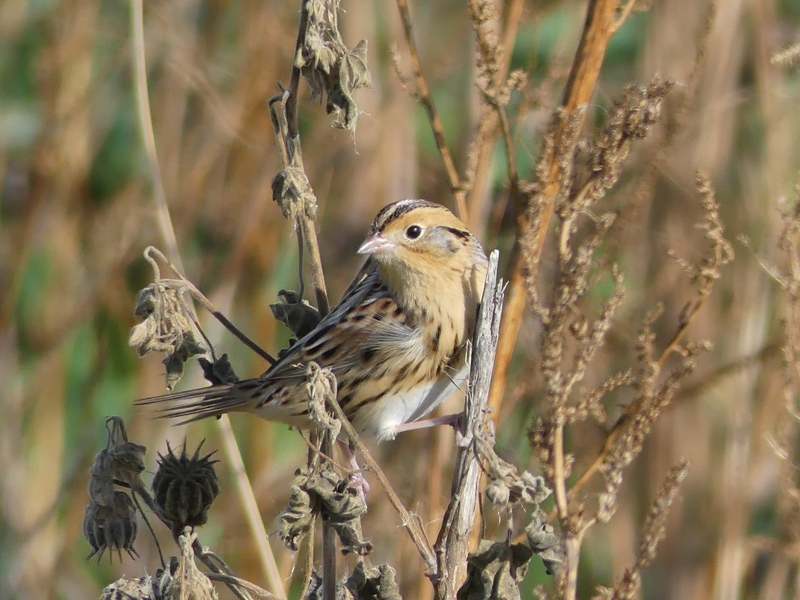 Another Harris’s Sparrow from Iowa. Can’t get enough of these beauties! Great Gray Owl hunting in the Superior National Forest. Photo by Erik Bruhnke. The Great Gray Owl was actively hunting in a bog in the Superior National Forest as we watched it from the side of Minnesota Highway 2 north of Two Harbors. It sat in the tops of trees surveying the ground below in the early morning light. 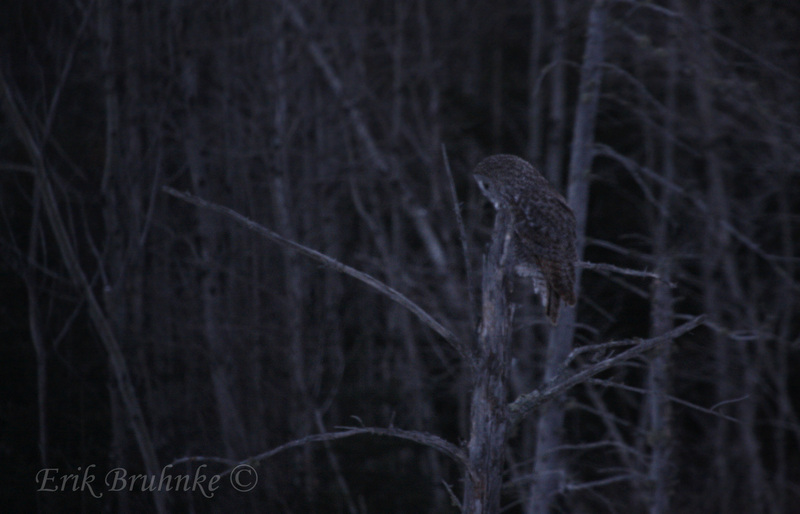 Every couple of minutes the owl flew to a different tree, always alert, but not seeming to care that we were watching. 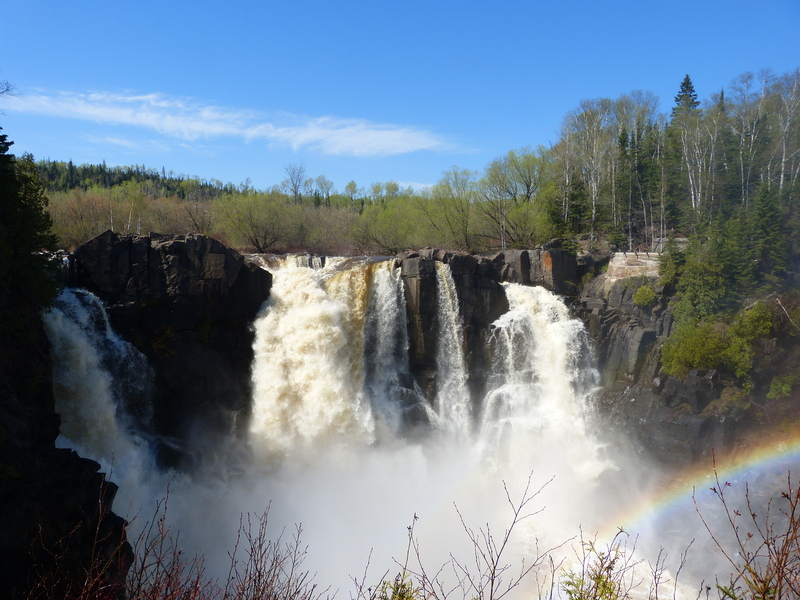 The fifteen minutes that we stood there in the serene beauty of the north woods was a wonderful start to the five-day trip. This owl was not in a known location, but Erik had found it simply by knowing the habitat and carefully watching. The Great Gray Owl is the tallest North American owl with a height of 24 to 33 inches. It has the largest wingspan of five feet, but it is just a big ball of fluff. It preys mostly on rodents with its small feet and talons. Both Great Horned and Snowy owls weigh half again as much and have larger feet and talons allowing them to capture lager prey. 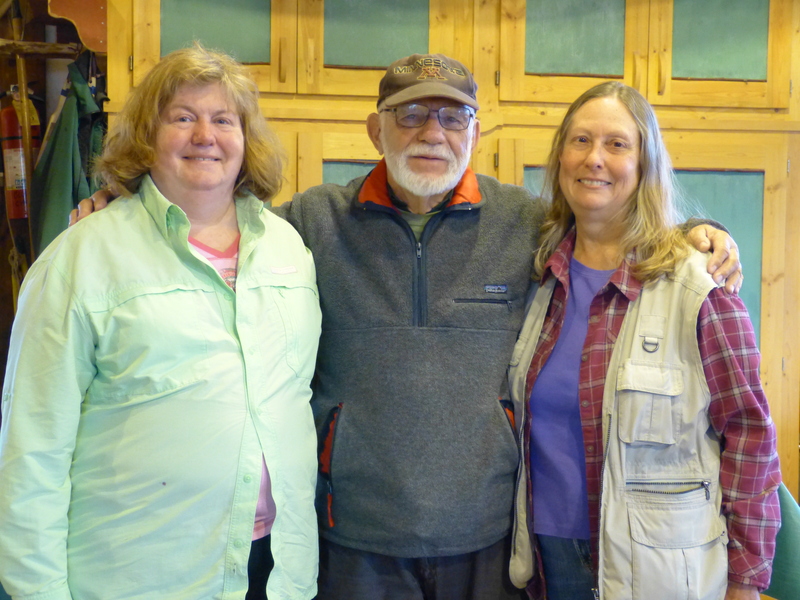 Myrna Harris and I had flown to Minnesota the day before where we met our guide, Erik Bruhnke, and Gary Ludi from Atlanta, for the Partnership for International Birding trip. On the first day, we birded a little in Minneapolis and then headed north where we saw the first owls of the trip, two Snowies at the Superior airport in Wisconsin. We learned that it was definitely not an irruption year, but that owls were actually rather scarce. Still, we could not stop ourselves from teasing Erik that we expected an owl every day. 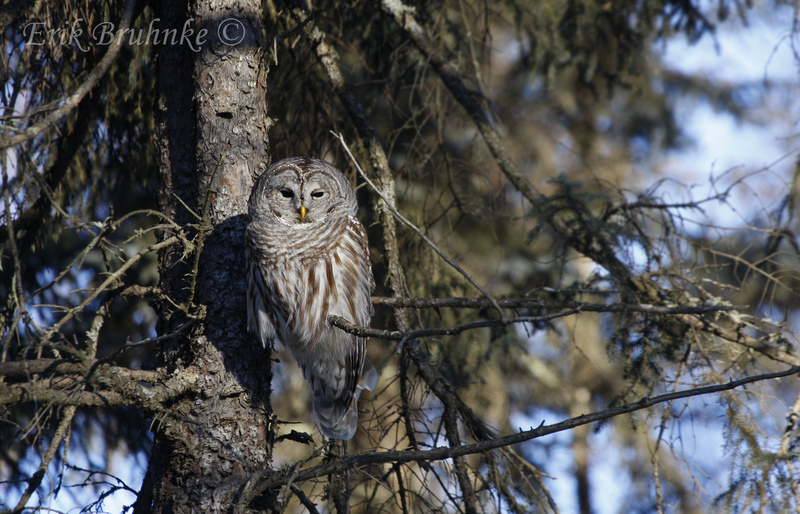 After our Great Gray Owl flew deeper into the woods and out of sight, we continued north. 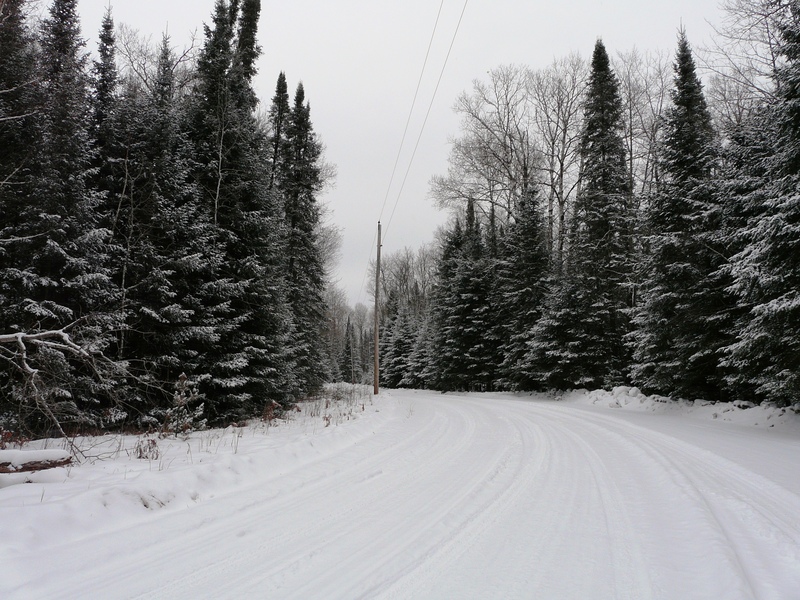 There were long stretches without any birds at all, but the ones that we did find were the northern specialties that had motivated us to travel to northern Minnesota in January when sane people were heading south. 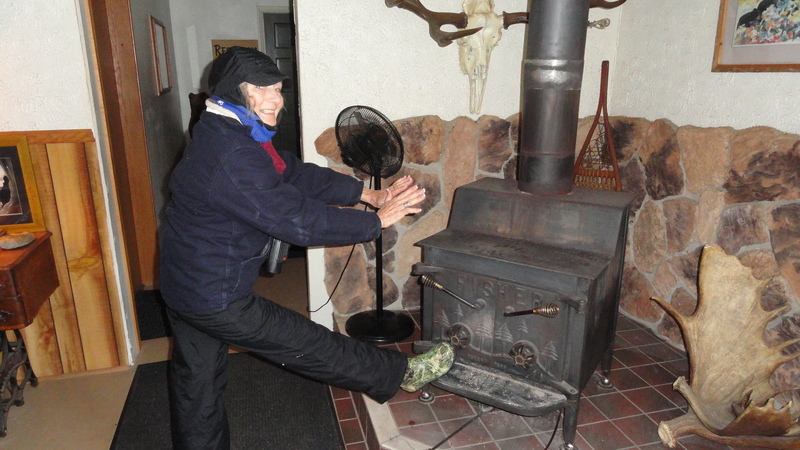 Myrna – warming up in Isabella. 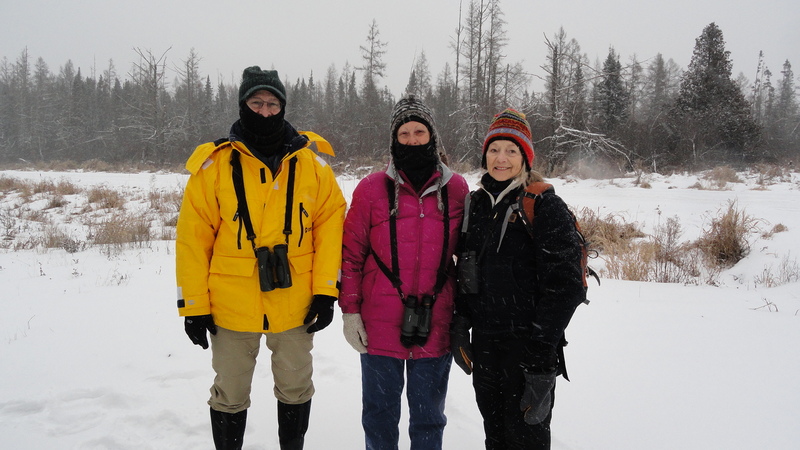 The temp outside was -9 degrees F.
In Grand Marais, we found a flock of Red Crossbills and Common Redpolls with one Hoary Redpoll and one White-winged Crossbill. Four finch species in one binocular view! 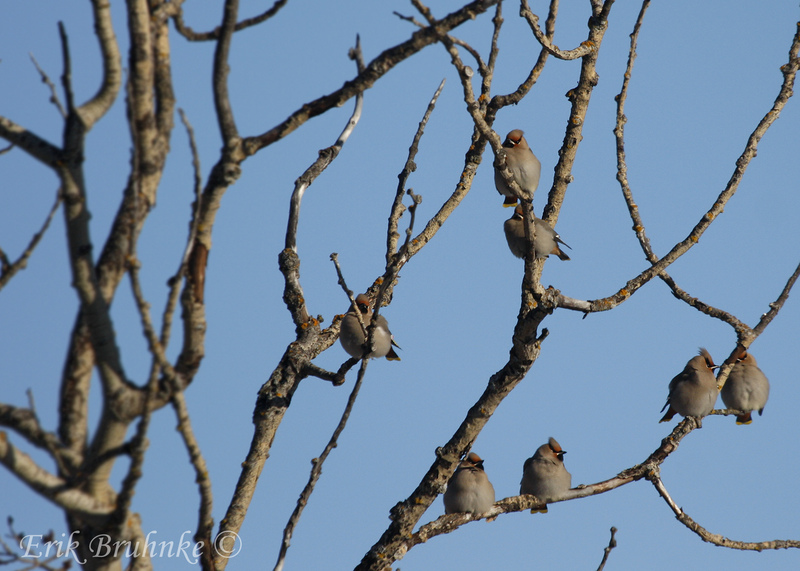 An even more exciting find was a flock of about 30 Bohemian Waxwings. Bohemian Waxwings. Photo by Erik Bruhnke. They were close enough to see well with our naked eyes, but with bins and scopes we could see every feather. These are BIG birds! Bohemian Waxwings are only one inch longer than Cedar Waxwings, but they weigh almost twice as much (56 grams vs. 32 grams). 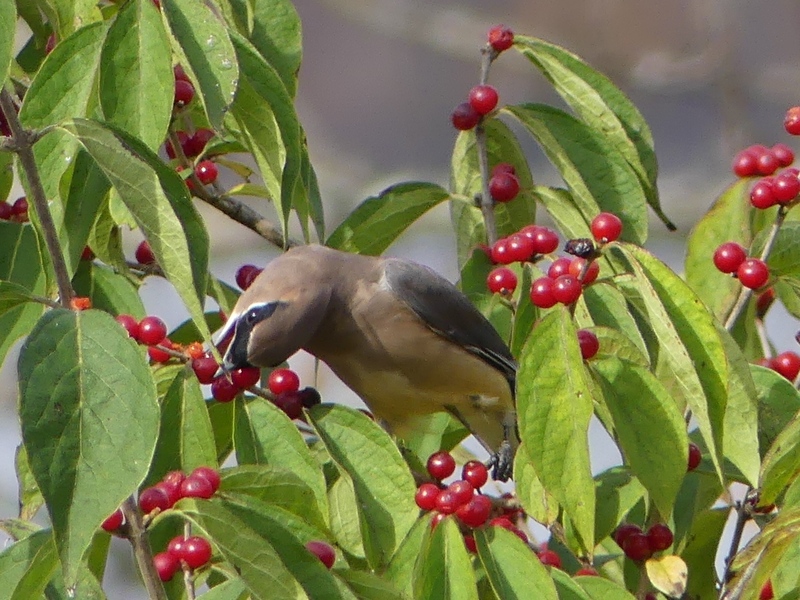 Their breasts and bellies are gray rather than the gorgeous bronze of Cedar Waxwings, but their classic waxwing head and face, intricate markings on the wings, and Rufous undertail coverts make them just as beautiful. 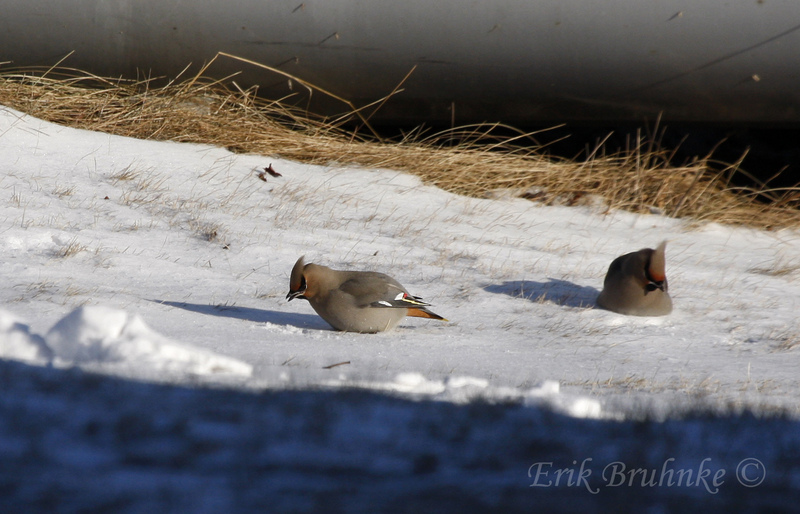 Bohemian Waxwings eating snow. Photo by Erik Bruhnke. Day three of the trip was spent entirely in Sax Zim Bog. 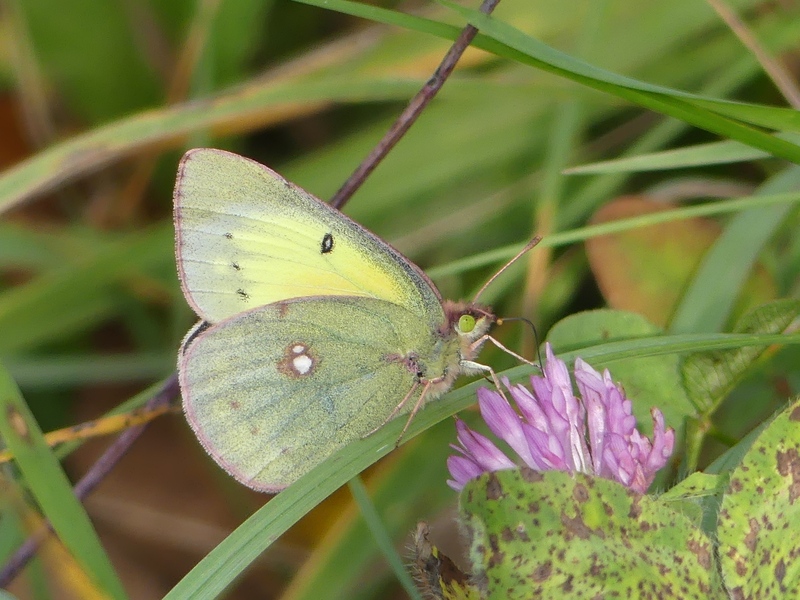 I recorded only 21 species that day, but three of them were lifers. 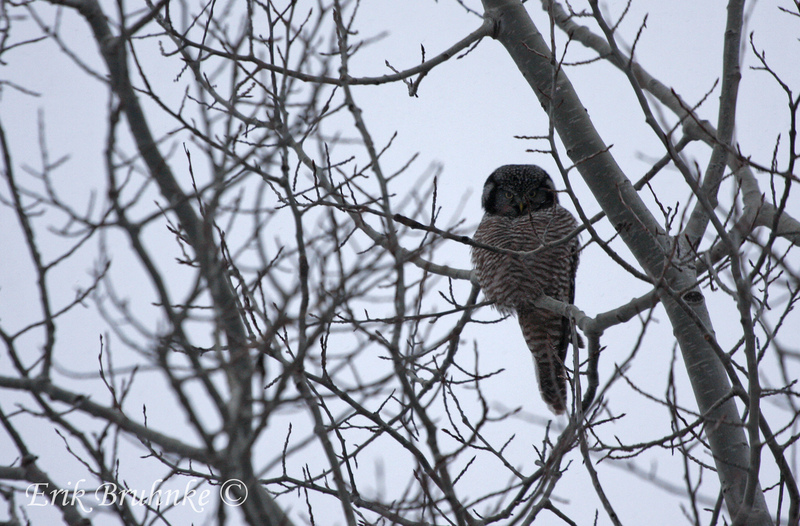 Our owl for the day was an extremely cooperative Northern Hawk Owl who allowed us excellent looks. Northern Hawk Owl. Photo by Erik Bruhnke. 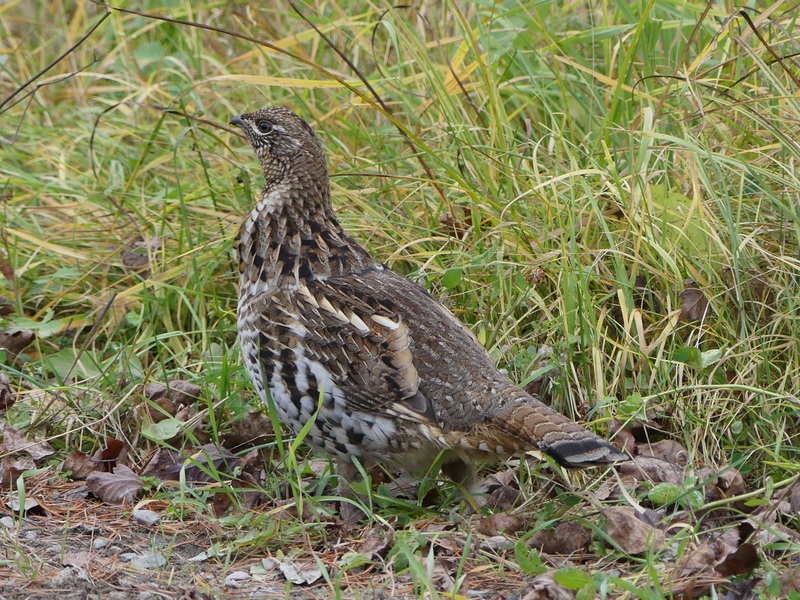 A common bird in the bog, but exciting for me was Ruffed Grouse – seven of them! This grouse was close to becoming a nemesis bird, but I can now claim it as a lifer. 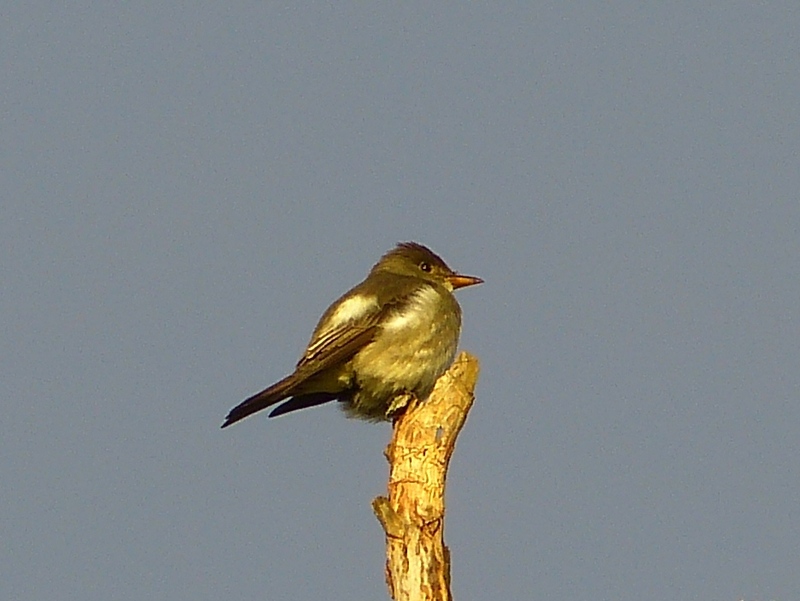 Most of them were adeptly clambering around in the tops of shrubs or trees, foraging on buds. 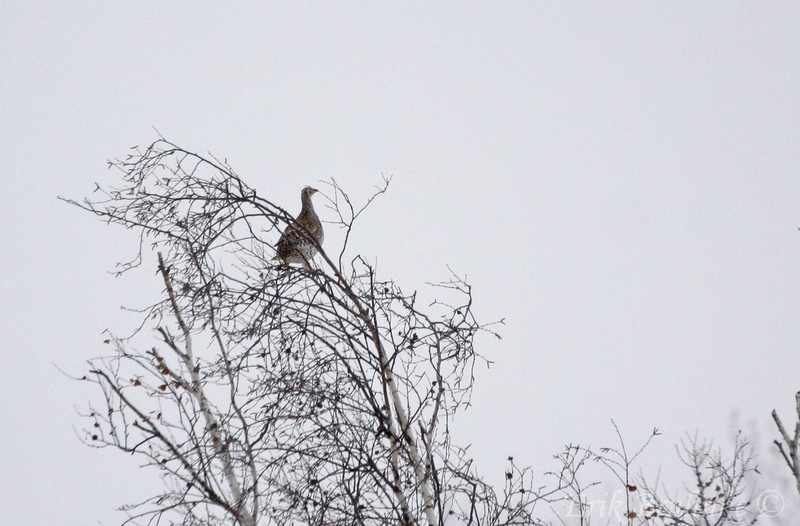 We also had a wonderful view of a Sharp-tailed Grouse. Sharp-tailed Grouse. Photo by Erik Bruhnke. 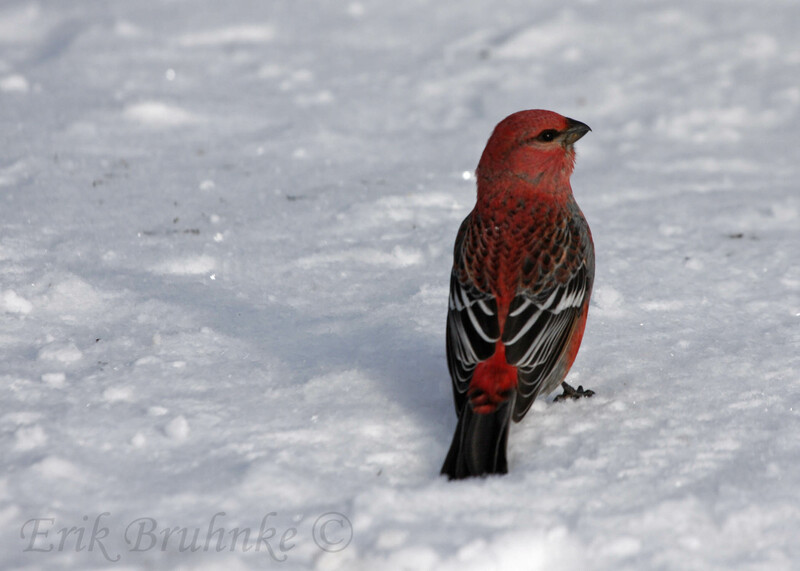 One of my favorite new birds is Pine Grosbeak – big, lovely, easy to identify, and very cooperative. Male PineGrosbeak. Photo by Erik Bruhnke. 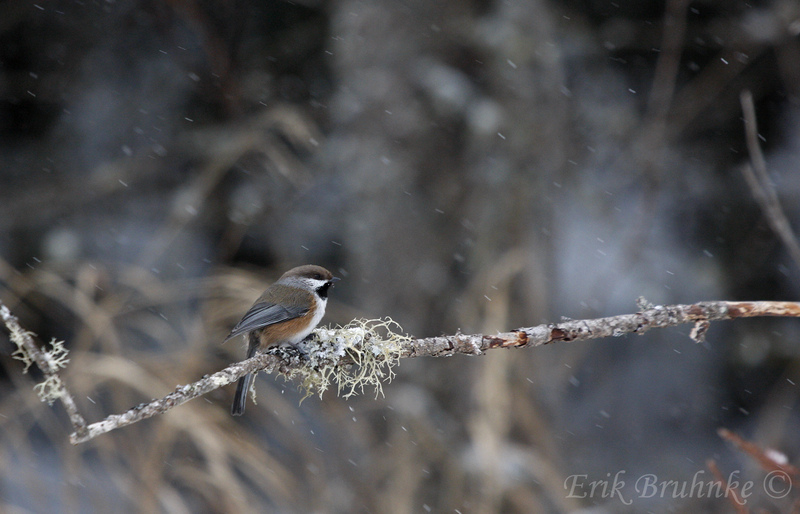 Boreal Chickadee – an adorable Minnesota specialty. Photo by Erik Bruhnke. Next it was time to look for gulls. But first we wanted one more look at a Snowy Owl, so we headed back to the Superior airport early on our fourth day. This time we found a Snowy perched in the top of a tree. This is not common behavior for a Snowy, but it allowed us to get the scope on it for a quality view. Crows harassed the poor bird and we could see the Snowy hiss at them. 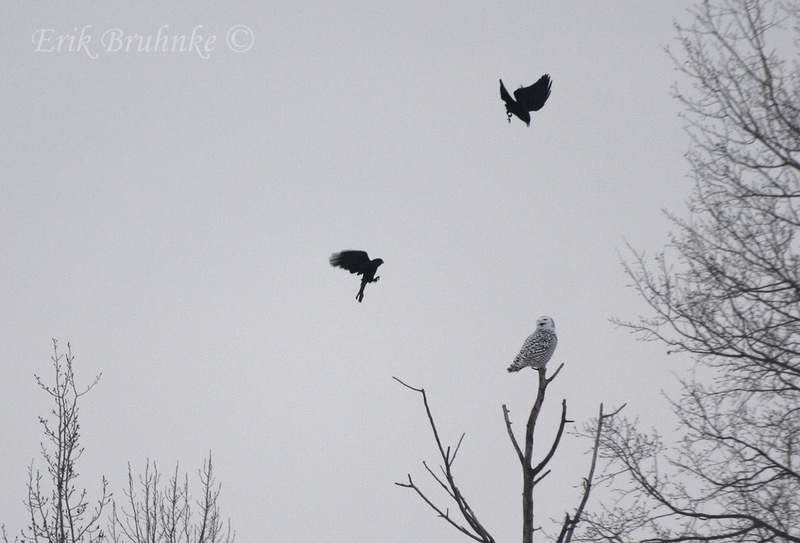 Snowy Owl being harassed by American Crows. Photo by Erik Bruhnke. Satisfied, with our Owl encounter of the day, we headed to the Superior landfill and Wisconsin Point to look for gulls. We found only Herring Gulls and fly-over Glaucous Gulls. But back at Canal Park in Duluth, we walked to the water’s edge and discovered a beautiful Iceland Gull right in front of us. This is the kind of gull that makes gull watching fun. Erik also found a Thayer’s Gull, another lifer for Gary, Myrna, and me. 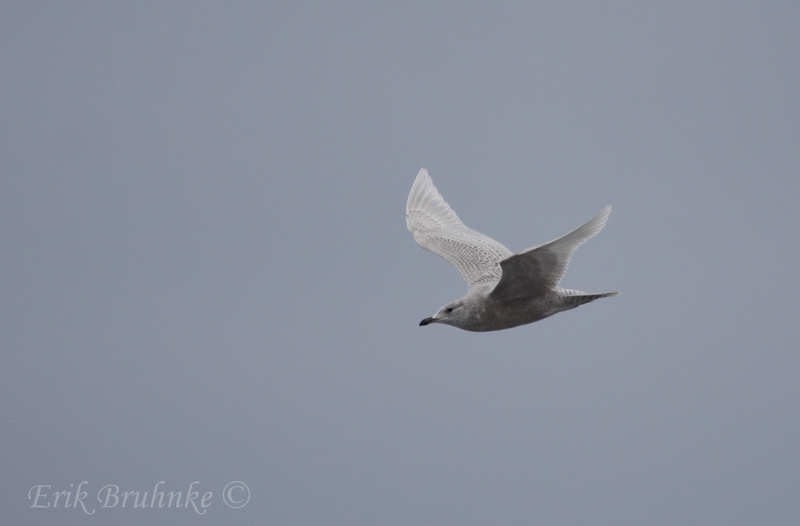 Iceland Gull. Photo by Erik Bruhnke. We celebrated our life gulls with one last visit to Sax Zim Bog where we found Redpolls everywhere, including five Hoaries. 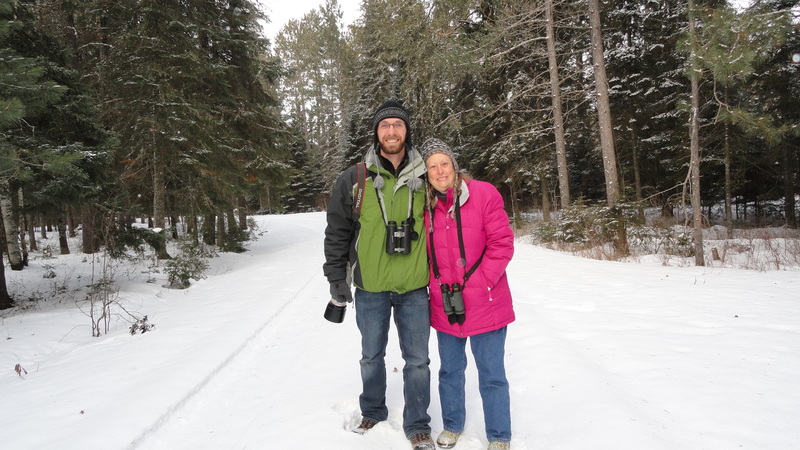 We also saw Pine Grosbeaks, two Northern Shrikes, and other bog birds including Bald Eagles, which we saw four of our five days in Minnesota. 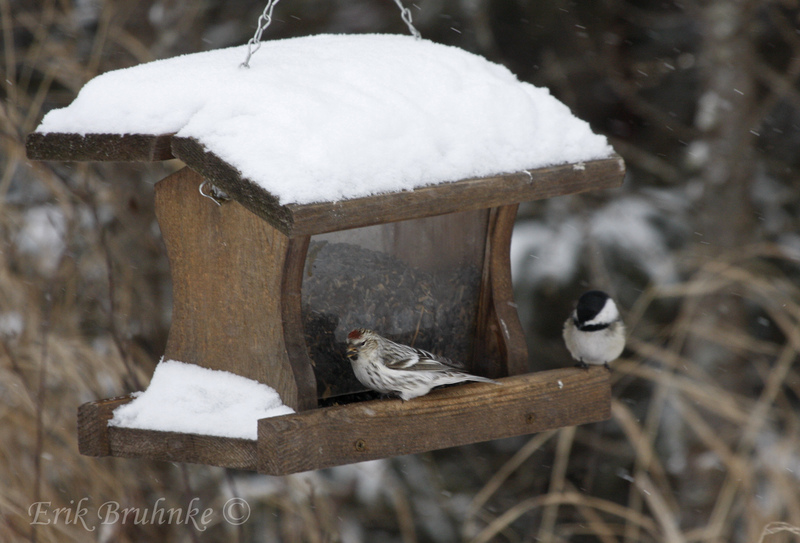 A Black-capped Chickadee checks out a Hoary Redpoll. Photo by Erik Bruhnke. 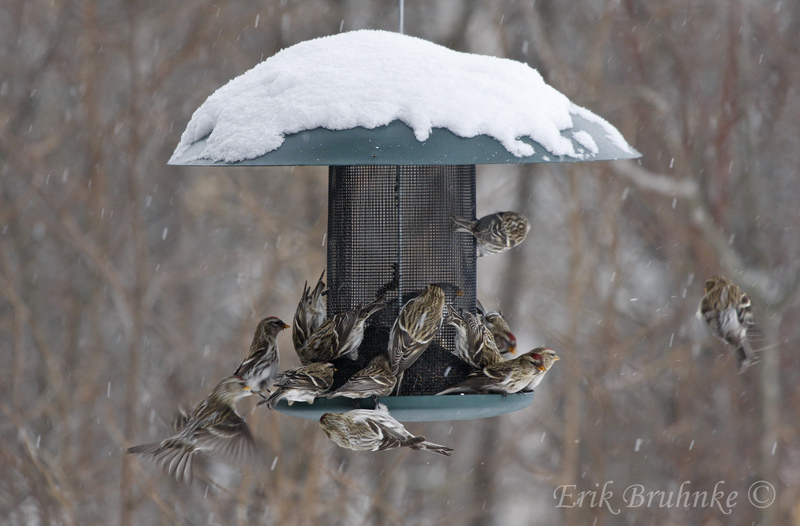 Common Redpolls were the most numerous feeder visitor. Photo by Erik Bruhnke. 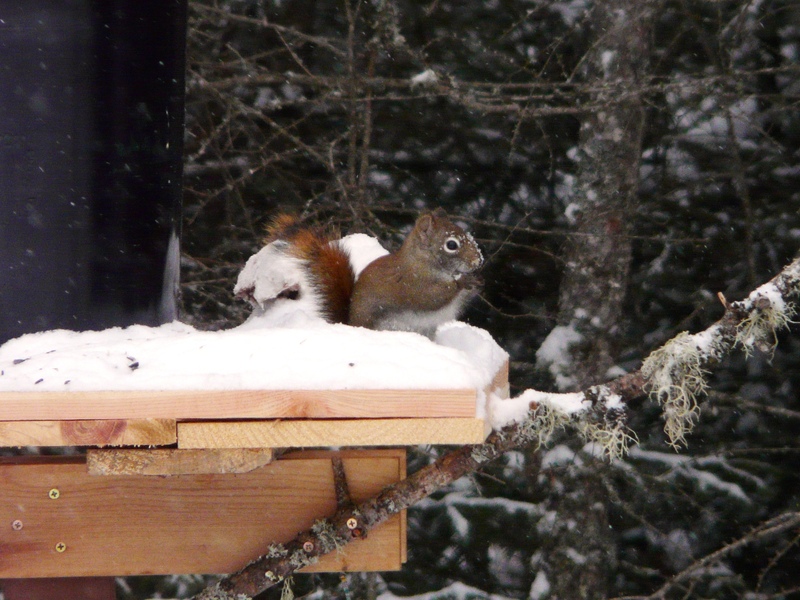 Minnesota’s Red Squirrels were much cuter than our Gray Squirrels at home. The last day of our trip came all too quickly, but we had seen most of the expected birds. The Boreal Owl just wasn’t meant to be for this trip. Ironically, they started showing up as soon as we returned home. So, our main target for the drive back to Minneapolis was Rough-legged Hawk. We finally found a distant dark morph Rough-legged Hawk at Crex Meadows in Wisconsin. The distance was too great to see detailed field marks, but we could see the characteristic hovering behavior. The Rough-legged Hawk is one of only two large raptors that hover regularly when hunting. The other large raptor that hovers is the Osprey. Although the bird was not close, it was exciting to see the special hunting behavior that makes it unique. On that last day, our owl for the day was this beautiful Barred Owl. Barred Owl. Photo by Erik Bruhnke. We boarded our plane for home with happy memories of winter in Minnesota and dreams of returning in the warmth of spring. This trip was January 16-20, 2013. Partnership for International Birding sponsored the trip and Erik Bruhnke of Naturally Avian was our guide. Many thanks for Erik for a wonderful trip and for granting permission to use his beautiful photos in this post. Erik and Shelley – trying to stay warm!